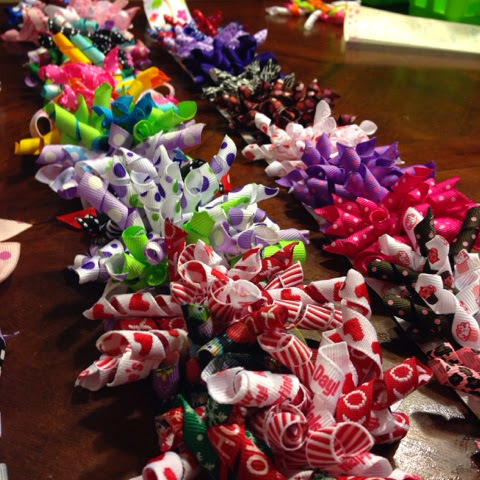 I spent some time over my Christmas break making hair bows for my girls! I had started making some of these back when I was on maternity leave (two years ago!) and then of course didn't have any time to make them since. This was on my "Christmas Break List" for this year. I love making them, so I knew I wanted to make time to do it! I posted some pictures on Instagram and had some people ask how I did it. 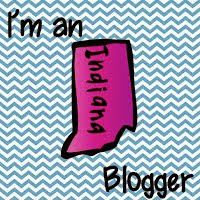 First, I have to give credit to the blog that I first learned how to do this from. But, then I have tweaked some things for myself!! :) For one thing, her version uses a different type of hair clips. I use the alligator type clips! I am anxious to try her type of clips too though. I believe these will be better when my girls are older! First of all, look at all of this random ribbon I have. After I started making them two years ago, when I would see cute ribbon on sale, I couldn't pass it up. I'm glad now because I made some cute ones this year! 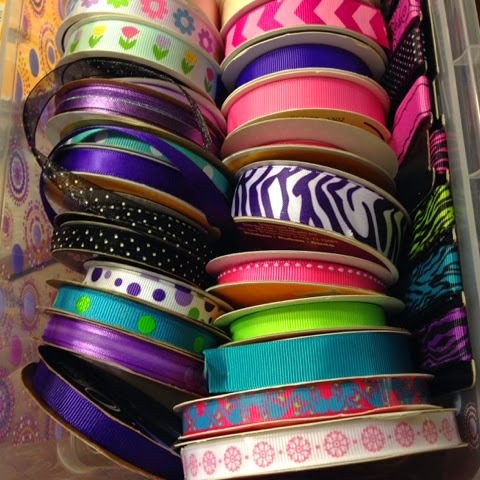 :) The problem with all of this cute ribbon is that most of it is too wide. Bummer! 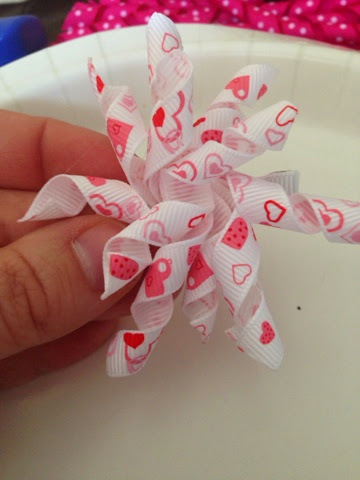 You have to use 3/8" ribbon for these curly bows. Believe me, I've tried the wider stuff because just REALLY wanted it to work. It doesn't. 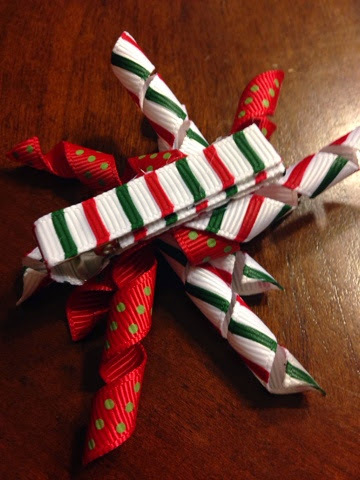 First, wrap your ribbon onto the dowels, securing at each end with a clothespin. 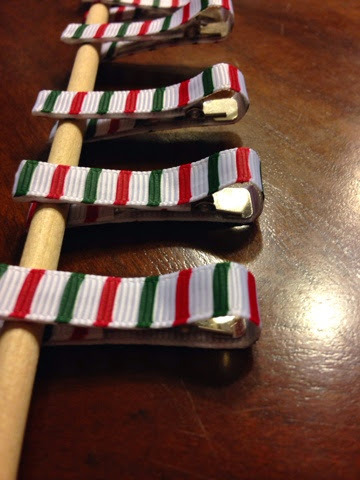 I know this sounds a bit OCD, but try to always wrap your ribbon in the same direction on all of your dowels. Just get in the habit of wrapping in a certain direction every time. 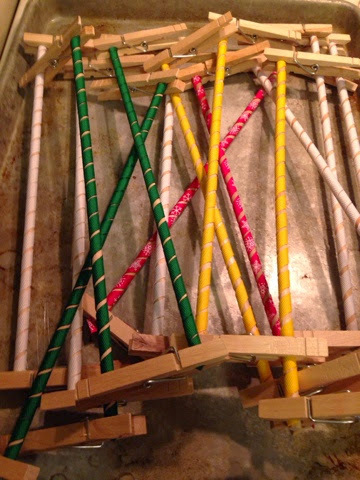 For example, I have the dowel in my right hand, and lay the ribbon over the top coming from the left. Once you try it, you'll see what I mean. Then I ALWAYS do it that way. This has taken me awhile to figure out. 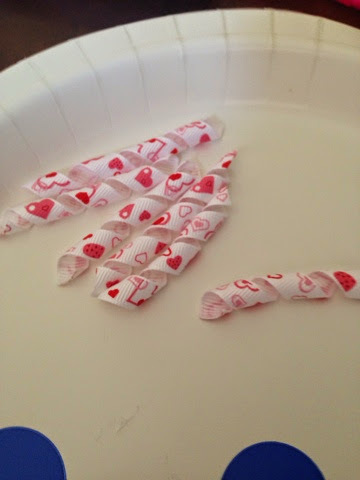 But, later when you put the bows together, it will be MUCH MORE HELPFUL if all of the spirals are going in the same direction. Hard to explain, easier to understand once you do it. 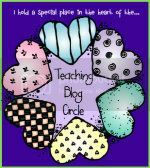 Make the spirals go in the same direction, just remember that. Then, put all of your dowels onto a cookie sheet and bake at 275 degrees for 25 minutes. Weird, right? I had no clue that people baked these things to make them curl!!! At first, I was super careful and laid each dowel out neat in a straight line, one layer. 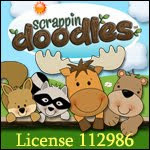 Now I just pile them on like the picture below. It still works fine! Don't worry! 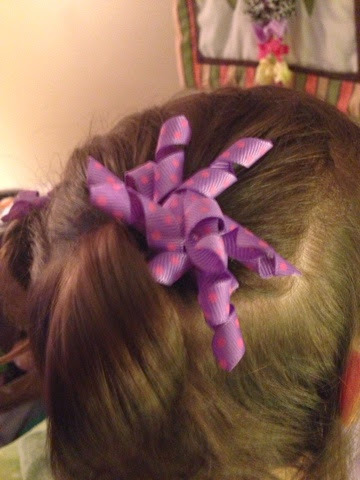 While the ribbons are baking, start preparing your hair clips. I don't have the best pictures of this. 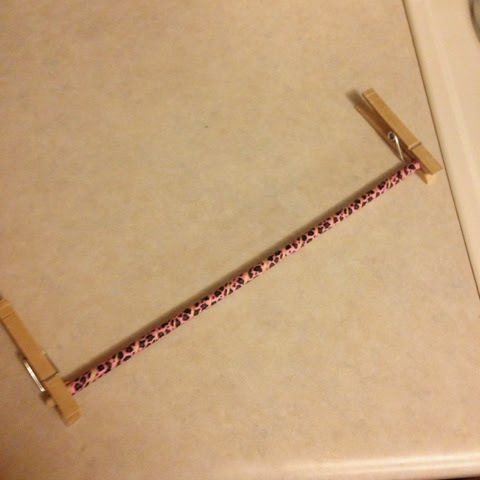 I cut pieces of ribbon and "wrap" the metal clip. 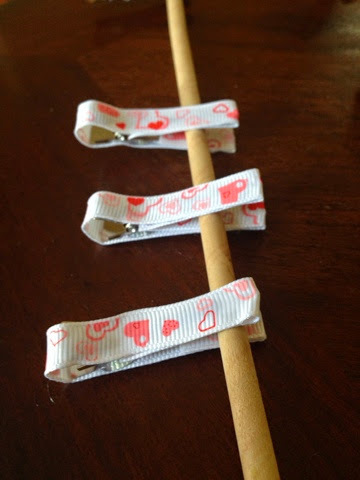 I start by putting a one inch line of hot glue onto the ribbon, then clip the metal onto it, wrap the ribbon around the clip, then add a little glue as I go. I feel like I need a few more hands when doing this! It takes a little practice, but you'll get it! Eventually, you'll know exactly how long you have to cut the ribbon as well. I try to use ribbon that is the same as the bow I'm planning on making or a coordinating color. 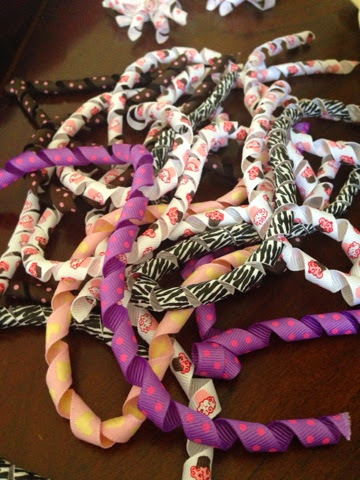 Here are some of my finished "wrapped clips". They are all glued and drying. (sometimes the glue sticks out and will make the whole thing stick together, that's why I have some clipped to a dowel while waiting.) Doesn't take long to dry at all! Once you make a few and play around with it, you'll decide how long you want the sections to be. Also, you can keep the sections short, but add more of them to the bow to make the bow bigger and fuller. Also, I like to work on a paper plate. It just makes it easier for me with the hot glue, etc. I don't have a picture of the next step because I only have two hands and don't like to get too crazy while using a lighter, but it's an important step, so don't skip this! 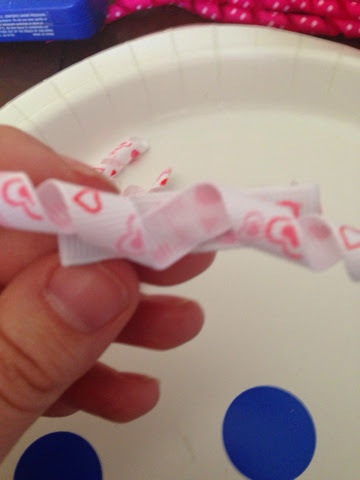 Use the lighter to lightly burn the ends of each ribbon at this point. I like to do it now rather than when the bow is done. It's much easier! So just lightly run the end of the bow over the flame. Be careful on some of the lighter colored ribbon, like the one above because it can turn it black or discolored. But, but if that happens, just cut that part off and do it again. 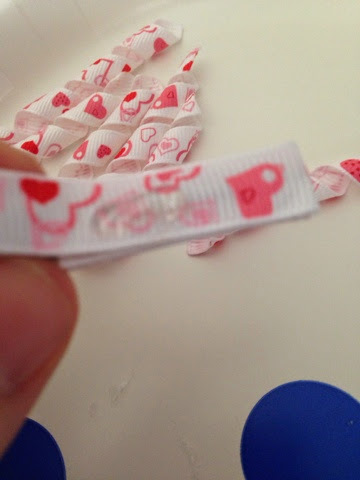 This is to prevent the ribbon from fraying! Very important! 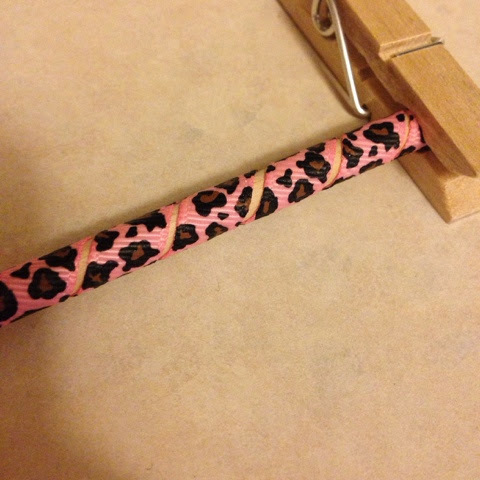 Next, start attaching your curled sections to the clip! I've tried to take a series of pictures here to show you how. 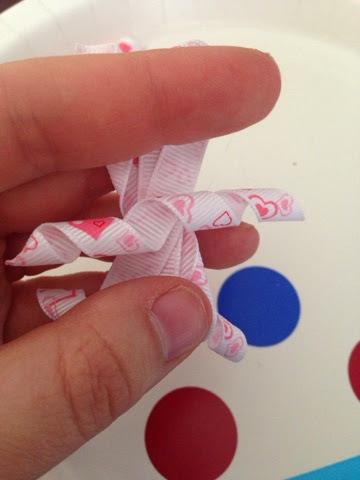 Use only a TINY dab of glue between each section of ribbon. That's all you need, plus you need to be careful not to burn yourself with the glue! Here are some other examples that show you the finished product!! 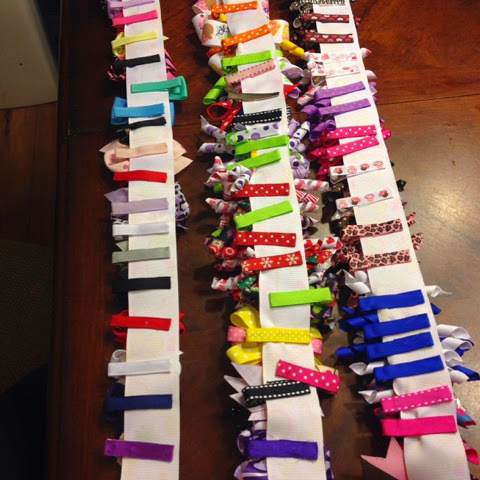 Storing the bows: I got this great idea from a friend. 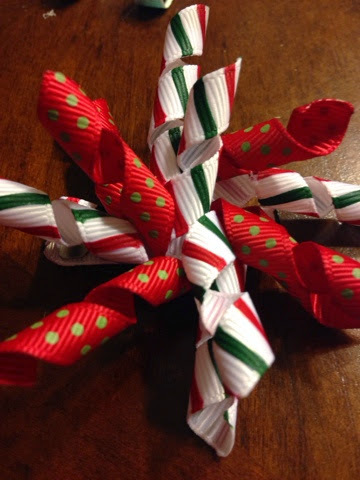 You just take a piece of wider ribbon, cut it and glue a loop at the top to use to hang it, then clip all the bows to the ribbon! SUPER EASY!!! This is the backside to show you what I mean.